Christmas holidays are a perfect time to rebuild the home lab. I have got a "Christmas present" from my longtime colleague knowing each other from times when we were both Dell employes. Thank you, Ondrej. He currently works for local IT company (Dell partner) and because they did a hardware refresh for one of their customers, I have got from him 4 decommissioned, but still good enough, Dell servers PowerEdge R620 each having populated a single CPU socket and 96 GB RAM. The perfect setup for a home lab, isn't it? My home lab environment is the topic for another blog post but today I would like to write about containerization of management CLI's (VMware PowerCLI and Dell RACADM) which will eventually help me with automation of home lab power off / on operations. Before these new Dell servers, I had in my lab 4 Intel NUCs which I'm replacing with Dell PE R620. Someone can argue that Dell servers will consume significantly more electrical energy, however, it is not that bad. Single PE R620 server withdraws around 70-80 Watts. Yes, It is more than Intel NUC but it is roughly just 2 or 3 times more. Anyway, 4 x 80 Watt = 320 Watt which is still around 45 EUR per month so I have decided to keep servers Powered Off and spin up them only on demand. Dell servers have out of band management (iDRAC7) so it is easy to start and stop these servers automatically via RACADM CLI. To gracefully shutdown all Virtual Machines and put ESXi hosts into maintenance mode and shutdown them I will leverage PowerCLI. I've decided to use one Intel NUC with ESXi 6.5 to keep some workloads up and running all times. These workloads are vCenter Server Appliance, Management Server, Backup Server, etc. All other servers can be powered off until I need to do some tests or demos in my home lab. I would like to have RACADM and PowerCLI also up and running to manage Dell Servers and vSphere via CLI os automation scripts. PowerCLI is available as an official VMware docker image and there are also some unofficial RACADM docker images available in DockerHub, therefore I have decided to deploy PhotonOS as a container host and run RACADM and PowerCLI in Docker containers. In this blog post, I'm going to document steps and gotchas from this exercise. Photon OS is available at GitHub as OVA, so deployment is very easy. The first step after Photon OS deployment is to log in as root with the default password (default password is "changeme" without quotation marks) and change root password. By default, IP address is assigned via DHCP. I want to use static IP address therefore I have to change network settings. In Photon OS, the process systemd-networkd is responsible for the network configuration. By default, systemd-networkd receives its settings from the configuration file 99-dhcp-en.network located in /etc/systemd/network/ folder. Setting a Static IP Address is documented here. -m creates the home directory, while -G adds the user to the sudo group. as described later in this post. Photon OS package manager is tdnf, therefore OS update is done with command ..
To run docker command without sudo I have to add linux user (me) to group docker. I already wrote the blog post how to spin up of PowerCLIcore container here. So let's quickly pull PowerCLIcore image and instantiate PowerCLI container. Now, I can remotely log in (SSH) as a regular user (dpasek) and run any of my PowerCLI commands to manage my home lab environment. Option --rm stands for "Automatically remove the container when it exits". To work with PowerCLI following commands are necessary to initialize PowerCLI configuration. The configuration persists within each container session, however, it disappears when the container is removed, therefore it is better to instantiate container without -rm option, configure PowerCLI configuration, keep the container in the system and start container next time to perform any other PowerCLI operation. Option --name is useful to set the name of the instantiated container because the name can be used to restart container and continue with PowerCLI. In such approach, the PowerCLI configuration persists. Another image I will need in my homelab is Dell RACADM to manage Dell iDRACs. Let's install and instantiate the most downloadable RACADM image. I would like to store all my home lab scripts in GitHub repository, synchronize it with my container host and leverage it to manage my home lab. git config --global user.name "myusrname"
git config --global user.email "mymail@example.com"
The option -rm is used to remove the container from the system after the PowerCLI script is executed. The whole toolset is up and running so the rest of exercise is to develop RACADM and PowerCLI scripts to effectively managed my home lab. The idea is to shut down all VMs and ESXi hosts when the lab is not needed. When I will need the lab, I will simply power on some vSphere Cluster and VMs within these clusters having vSphere tag "StartUp". Hope I will find some spare time to finish my idea and automate this process which I have to do manually at the moment. One of my customers is experiencing a weird issue when using a traditional enterprise backup (IBM TSM / Spectrum Protect in this particular case) leveraging VMware vSphere Storage APIs (aka VDDK) for image-level backups of vSphere 6.5 Virtual Machines. They observed strange behavior on the size of incremental backups. IBM TSM backup solution should do a full backup once and incremental backups forever. This is a great approach to save space on backup (secondary) storage. However, my customer observed on some Virtual Machines, randomly created over the time, almost full backups instead of expected continuous incremental backup. This has obviously a very negative impact on the capacity of the backup storage system and also on backup window times. The customer has vSphere 6.5 U2 (build 9298722) and IBM TSM VE 8.1.4.1. They observed the problem just on VMs where VM hardware was upgraded to version 13. The customer opened a support case with VMware GSS and IBM support. "Error caused by file /vmfs/volumes/583eb2d3-4345fd68-0c28-3464a9908b34/VM-NAME/VM-NAME.vmdk"
VMware Support (GSS) instructed my customer to reset CBT - https://kb.vmware.com/kb/2139574 or disable and re-enable CBT - https://kb.vmware.com/kb/1031873 and observe if it solves the problem. A few days after CBT reset, the problem with backup occurred again, therefore it was not a resolution. I did some research and found another KB - CBT reports larger area of changed blocks than expected if guest OS performed unmap on a disk (59608). We believe that this the root cause and KB contains workaround and final resolution. When an unmap is triggered in the guest, the OS issues UNMAP requests to underlying storage. However, the requested blocks include not only unmapped blocks but also unallocated blocks. And all those blocks are captured by CBT and considered as changed blocks then returned to backup software upon calling the vSphere API queryChangedDiskAreas(changeId). Disable unmap in guest VM. Warning! Disabling UNMAP in guest OS can have a tremendous negative impact on storage space reclamation, therefore, fixing space issue in secondary storage can cause storage space issue on your primary storage. Check your specific design before the final decision on how to workaround this issue. If you have VDDK 6.7 or later libraries, take the intersection of VixDiskLib_QueryAllocatedBlocks() and queryChangedDiskAreas(changeId) to calculate the actually changed blocks. The backup software should not use just API function QueryChangedDiskAreas but also function QueryAllocatedBlocks and calculate disk blocks for incremental backups. Based on VDDK 6.7 Release Notes, VDDK 6.7 can be leveraged even for vSphere 6.5 and 6.0. For more info read Release Notes here. The virtual disk must be thin-provisioned. Based on conditions above I personally believe, that another workaround to this issue would be to not use thin-provisioned virtual disks and convert them into thick virtual disks. As far as I know, thick virtual disks do not pass UNMAP commands through VM hardware, therefore it should not cause CBT issues. My customer is not leveraging thin-provisioning on physical storage layer, therefore he is going to test workaround recommended in KB 59608 (disable UNMAP in Guest OS's) as a short-term solution and start the investigation of the long-term problem fix with IBM Spectrum Protect (aka TSM). It seems IBM Spectrum Protect Data Mover 8.1.6 is leveraging VDDK 6.7.1 so upgrade from current version 8.1.4 to 8.1.6 could solve the issue. This is a very short post in reaction to those who asked me recently. When you update to the latest ESXi builds you can see the warning message as depicted on the screenshot below. This message just informs you about Intel CPU Vulnerability described in VMware Security Advisory 2018-0020 (VMSA-2018-0020). Elimination of "L2 Terminal" security vulnerability is described in VMware KB 55806. It is configurable by ESXi advanced option VMkernel.Boot.hyperthreadingMitigation. If you set a value to TRUE or 1, ESXi will be protected. The warning message suppression is configurable by another ESXi advanced option UserVars.SuppressHyperthreadWarning. A value TRUE or 1 will suppress the warning message. VMware Metro Storage Cluster - is it DR solution? Yesterday morning I had a design discussion with one of my customers about HA and DR solutions. 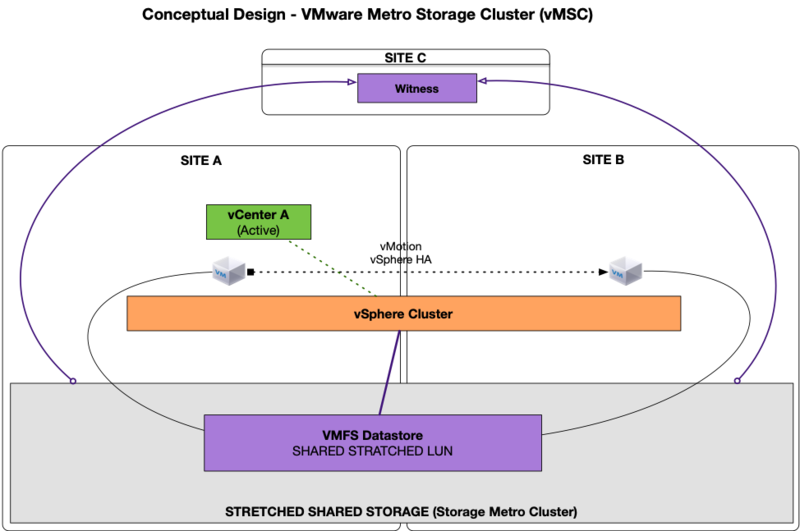 We were discussing VMware Metro Storage Cluster topic the same day afternoon within our internal team, therefore it inspired me to write this blog article and use it as a reference for future similar discussions. By the way, I have presented this topic on local VMUG meeting two years ago so you can find the original slides here on SlideShare. On this blog post, I would like to document the topics, architectures, and conclusions I discussed today with several folks. Stretched (aka active/active) clusters are very popular infrastructure architecture patterns nowadays. VMware implementation of such active/active cluster pattern is vMSC (VMware Metro Storage Cluster). Official VMware vSphere Metro Storage Cluster Recommended Practices can be found here. Let's start with definition what vMSC is and is not from HA (High Availability), DA (Disaster Avoidance) and DR (Disaster Recovery) perspective. DR is not only about infrastructure but also about applications, people and processes. DR should be tested on regular basis. Can you afford to power-off the whole site and test that all VMs will be restarted on the other side? Are you sure the applications (or more importantly business services) will survive such test? I know a few environments where they can afford it but most enterprise customers cannot. DR should allow going back into the past, therefore the solution should be able to leverage old data recovery points. Recoverability from old recovery points should be possible on the application group and not for the whole infrastructure. It is not very well known, but VMware SRM nowadays supports Disaster Recovery and Avoidance on top of stretched storage. It is described in the last architecture concept below. So let's have a look at various architecture concepts for cross-site HA and DR with VMware products. Snapshots (multiple recovery points) on backup site are optional but highly recommended if you do DR planning seriously. Maximal infrastructure independence, therefore we have two independent fault zones. 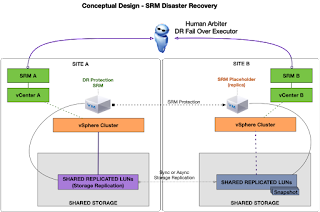 The only connection between the two sites is storage (data) replication. Human-driven and well-tested disaster recovery procedure. Disaster Avoidance (migration of applications between sites) can be achieved but only with business service downtime. Protection Group has to be shut down on one site and restarted on another site. Disaster Avoidance without service disruption is not available. Disaster Avoidance without service disruption leveraging cross vCenter vMotion technology. Virtual Machine internal identifier (moRef ID) is changed after cross vCenter vMotion, therefore your supporting solutions (backup software, monitoring software, etc.) must not be dependent on this identifier. Infrastructure availability and recoverability are two independent infrastructure qualities. Both of them have a positive impact on business continuity but each solves the different situation. High Availability solutions are increasing the reliability of the system with more redundancy and self-healing automated failover among redundant system components. Recoverability solutions are data backups from one system and allow a full recovery in another independent system. Both solutions can and should be combined in compliance with SLA/OLA requirements. VMware Metro Storage Cluster is great High Availability technology but it should not be used as a replacement for disaster recovery technology. VMware Metro Storage Cluster is not a Disaster Recovery solution even it can protect the system against two specific disaster scenarios (single site failure, single storage system failure). You also do not call VMware "vSphere HA Cluster" as DR solution even it can protect you against single ESXi host failure. The final infrastructure architecture always depends on specific use cases, requirements and expectations of the particular customer but expectations should be set correctly and we should know what designed system does and what does not. It is always better to know potential risks and not have unknown risks. For known risks, mitigation or contingency plan can be prepared and communicated to system users and business clients. You cannot do it for unknown risks. There are other posts on the blogosphere explaining what vMSC is and is NOT.